Long before eBay and Craigslist, you didn’t have to get online to buy something a stranger no longer wanted. Instead, you just went to a garage sale. Talk about instant gratification! 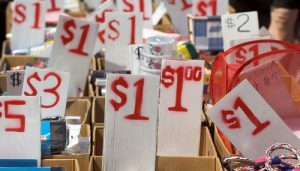 Even with the competition from the online alternatives, garage sales are a more than $200 million “industry” every year, which is a lot of old CDs and used clothes being sold in neighborhoods across the country, not to mention capital gains. Averaging $4.2 million in weekly revenue, garage sales add up to serious cash. But, if your garage sale is among the 165,000 held every week, do you need to report how much you made to the IRS? Probably not, because the items typically are sold at a loss. When determining if a sale must be reported as income it isn’t the dollar amount that matters or how it was sold, but whether the item was sold for more than it was originally purchased. This is because selling something for more than you bought it results in a capital gain, which must be reported to the IRS as income. Capital gains typically are realized when selling items that have appreciated in value, such as antiques and collectibles. At any time, the people who sell at any of these levels can have a sale that results in a taxable capital gain. Following is a brief explanation of these types of sellers. When the sales price is less than what was originally paid for an item, no capital gain is realized. If you purchased a new lawn mower for $250 and later sold it for $50, that is not a $50 capital gain. Instead it is a $200 personal loss, which isn’t tax deductible. Those looking for a tax break could give their unwanted items as charitable donations to eligible organizations, making the items’ fair market value a possible itemized tax deduction. Just be sure to get receipts and keep a list of the items you donate. Now, just as a one-time thing, if you had an antique lawn mower your great-uncle gave you and you sold it for $100 on eBay, that’s a $100 capital gain and it is reportable taxable income. But, if you start repairing antique lawn mowers to sell them on eBay, that activity could be considered a business by the IRS – even if you just think of it as a hobby. IRS guidelines state hobbyists sell items occasionally, not intending to make a profit from their activity. Hobbyists may deduct the expenses related to their hobby as miscellaneous itemized deductions, but not beyond the total revenue generated from the hobby. And, only the amount in excess of 2 percent of your adjusted gross income is deductible. If sales become frequent activities done to make a profit, the IRS may classify that hobby as a business. If the taxpayer is the sole proprietor, purchases and sales must be reported on Schedule C. A tax benefit of operating a business is that ordinary and necessary business expenses can directly offset income and a loss can be shown. No matter what is sold (it’s a treasure to someone) or how often, all taxpayers who make a profit on a sale are obligated to report that money as taxable income. Determining what your tax obligations are for any sales you make can be determined with the guidance of a tax professional.